New York NY: April Transfers! On Monday, April 2, 2018 we welcomed 8 new missionaries! The plane arrived on time but due to a winter storm earlier in the day the airport was backed up. The missionaries sat on the tarmac for an additional hour waiting for a gate. Those of us waiting were able to talk with a lot of people in the airport and share brief gospel messages with them. Here are a couple pictures taken outside the mission home that morning. We attended the Temple Tuesday afternoon with this group of missionaries who would be going home the next day. They are remarkable! We have watched them grow in countless ways the past 18 months and 2 years. They are faithful, devoted servants of the Savior and they have experienced true joy in their service! 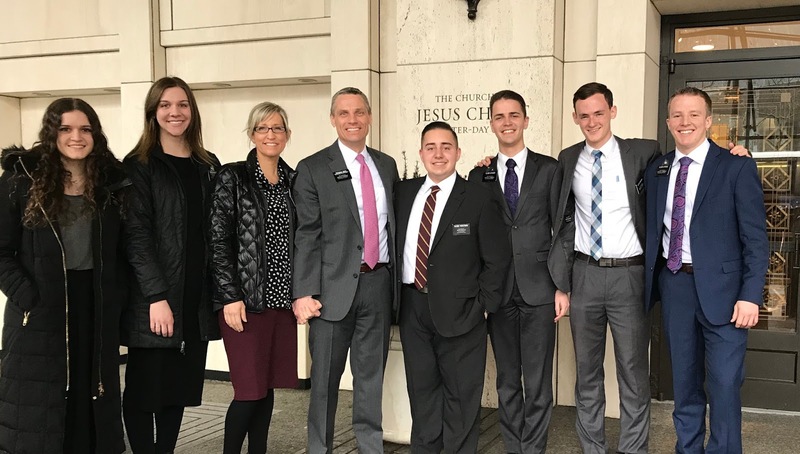 Dave loves to run with the missionaries and they love to run with him. push themselves (diligence, persistence, determination) and go 3 or 4! God be with you til we meet again!